The Sacred City of Caral-Supe is considered to be the cradle of civilization in the Americas. This archeological site of an urban settlement belonged to the complex and fully developed Supé-state. It was constructed between 3000-1800 BC, in the same timeframe as the the works of the Ancient Egyptians and Mesopotamians. 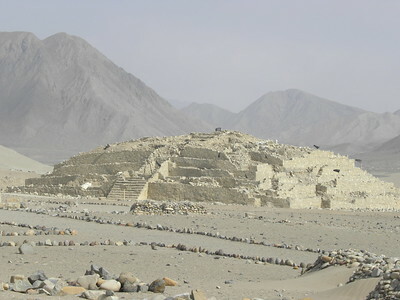 Caral is one of 18 settlements in the fertile Supe river valley. On a dry desert terrace, the Supé built a monumental settlement measuring 66 ha. The structures were mostly made of stone, with some woodwork. The site consists of the upper half and lower half of the city (including 6 pyramids), the outlying sector with residential units and the archeological site of Chupacigarro. There a geoglyph and astronomical observation points have been found. The complexity of the Supé civilization is shown by the discovery here of the first quipu, a system of knots to record information. The site is seen as the “Mother Culture” of the Peruvian civilizations, that ended with the Inca. Caral-Supé was excavated relatively late, in 1994, although it had been discovered already in 1905. This is a WHS to love. I had not visited a site so inaccessible and obscure since Romania’s Dacian Fortresses last year. Only one WHS “collector” had been here before me. I had some trouble fitting it into my Peru itinerary myself. At first I wanted to go there on a day trip from Lima, but these tours are very expensive and it takes over 3 hours one way to get at Caral. After some reshuffling I decided to visit it from the nearest city, Barranca, and spent a night there. This also breaks the long trip from Huaraz to Lima or the south of Peru in two. My hotel in Barranca easily connected me to a driver for a half day trip out there for 25 EUR. The road is now almost fully paved, so it takes only half an hour by car from Barranca to get at Caral. During the months from December to May it is impossible to cross the river to access the archeological site. My driver did not want to take any chances, although the water level seemed pretty low to me. So we drove to the other access point somewhat to the east. From there you have to cross a bridge on foot, and walk 2km to the site. It is signposted well, and there also is a guard posted at the start of the foot path. This way you end up at the other side of the complex from the visitor center, so you’ll have to walk a little more to get your ticket. I did not know what to expect, but this is an enormous complex of pyramids, temples and other structures almost hidden in a valley in the desert. It is pretty well preserved (and sometimes restored), much better than Pachacamac for example. The natural setting is almost surreal, like a moon landscape. It was and is a fertile area however, due to the Supé-river that crosses the valley. The river banks are still used for agriculture. I hired a guide to show me around. This tour of about an hour only gave me a glimpse into the world of the Supé. Much is still unknown too. The walls of the buildings were painted yellow, some of the paint is still there. They used a kind of nets to carry the stones that were used in construction - the remains can be seen. No cemeteries have been found, only the remains of a sacrificed young man have been discovered and those of several children that died of natural causes. There is much more to tell about this fascinating site. After my visit I read the full nomination file, which is very much recommended. Despite its remote location, the complex is well geared to receive visitors. There’s also an info center on site where some of the objects that have been found at Caral are shown. Site visited April 2018. For me getting to the World Heritage Site of Caral turned out to be agony and race against time but in the end it won over me. 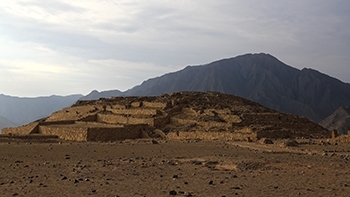 I guess everything worth knowing about this site and its historical importance have been told already on the previous reviews so on my review I focus mainly on my trip to Caral. 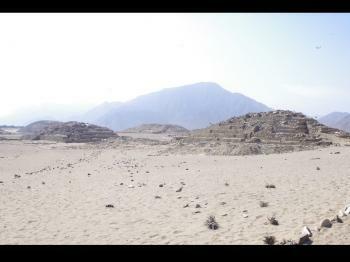 My plan was to visit Caral on my way from Huaraz to Lima. I knew this could be a bit tight schedule for one day but I decided to give it a try. I left from Huaraz bus station at 9 AM and was at Barranca four hours later. The bus left me at some gas station outside the city centre so I had to walk quite a long distance with my large suitcase in the mid day heat. During my walk I tried to catch a taxi to Caral. The task proved to be very hard. There were only lots of mototaxis that tooted at me all the time. I thought that those are not suitable for my needs. I saw only few taxi cars and those were reserved. At some point I got tired of walking and trying to catch a taxi. Then I saw a hotel and went to the reception to ask about driver to Caral. The receptionist was very kind and she arranged a driver for me but I had to wait for some 45 minutes for it to show up. After some price negotiations we headed towards Caral. I was already getting a bit worried because the site is open until 5 PM and I was running out of time. Previous reviewer told that it takes only half an hour to get to Caral from Barranca. Maybe that was a case in 2011 but seven years later the trip took over an hour. The last 25 kilometres from the beginning of Supe roundabout the road is in a really terrible condition. The tarmac has crumbled and the driver had to drive slowly and make constantly zigzag moves to avoid the biggest holes on the road. It was a really bumpy ride. Along the trip the driver stopped two times to ask from the local people is it possible to cross the river with the car. The first one said it is possible but the other one said it is not. So we went to check out the possibilities to the riverbank where we saw that there was absolutely too much water. There was no way we could cross the river. Maybe with SUV it would have been possible but not with the normal car. We decided to drive back to the road but then the car stuck to the river bank from the bottom. We both had to dig stones underneath the car in order to get it loose. Then we had to drive another 10 minutes detour via bridge. When we arrived at the parking place of the Caral site it was almost 4 PM so I would have only one hour at the most to explore the site. I was getting a bit disappointed. There is one kilometres walk from parking place to the site. All the time I was worried that there is too little time left to see the site properly. From the top of the riverbank it is possible to see most of the structures. There is even a viewing platform outside the gates. At the entrance gate there were some information exhibitions and empty souvenir stalls. When I tried to buy a ticket staff said that I can’t visit the site on my own, only with guided group tour. I was there alone so I wondered what to do next. Fortunately at the gate appeared British and Mexican couples so we formed a group and bought a Spanish speaking guide. The guide led us through a route which formed a loop around the ancient Plaza Central. We stopped in front of important structures and the guide explained historical details thoroughly. I couldn’t follow fast-paced Spanish talking so I concentrated mainly on photography and enjoying the nice atmosphere and sunset. We started from the Amphitheater Temple which is the most remarkable building in the lower part of the city. There is the first of two large sunken circular plazas of Caral. Then we moved on to the Huanca Pyramid and Gallery Pyramid which are beautiful square shaped stepped pyramids. Finally we reached the Greater Pyramid which is the largest and most important architectural complex in the city. Even though the area of the building is big, 170 x 150 metres, the low profile makes it look not that impressive. In front of the stepped pyramid is sunken circular plaza the diameter of which is 37 metres. Lastly, we studied the Central Pyramid and Quarry Pyramid from a viewing platform. The Central Pyramid is the second largest building in the city. Unlike many other buildings in Caral it is not in that good condition but it is quite imposing structure against the background of distant mountains. After the guided tour we returned to the visitor centre pleased of what we saw. Even though the site closed at 5 PM, with the guide we had an opportunity to explore it almost for two hours and I left one hour after closing time in a most amazing sunset. It is remarkable that this most ancient city of the Americas which is almost 5000 years old is mostly in a good condition. Also worth noticing is that along the road to the site of Caral through the river valley of Supe I saw a lot of other ancient structures and settlements which are inside the buffer zone of this WHS. I guess that visiting Caral along the bus trip from Huaraz to Lima is quite a popular alternative among WHS travellers. For me it was little bit too tight day but with better preparation it is easily doable. Nonetheless, the site itself is remarkable and enjoyable to visit. It is a joy to give it 4/5 stars rating. I took a bus from Huaraz and arrived at Barranca city's roadside around 4pm so I have to stay one night here. There are frequent collectivos at calle Berenice Davila as early as 7am for 8 soles and it will reach Puente Caral after 45 minutes. It's another 15 minutes walk after the bridge and you will reach the visitor center and the ticket booth. It's 11 soles for foreigners and you have to pay maximum 20 soles for the guided tour. I arrived early that day around 9am so I had to wait another hour for other visitors to share the guide fee. During the wait you can go through the signboards of Caral's history and facts, then you can visit the souvenir shops. There were finally 7 of us who decided to share the guide fee, so each of us paid around 3 soles for it. The more people the less you pay. The guided tour is all in Spanish, for those who are not fluent in Spanish (like me) can look at the bilingual signboard in front of the ruins to get a picture of what's the usage and what was discovered. The whole tour is under the sun with no cover at all, so make sure to put on sunscreen or wear a hat. It's windy and chilly sometimes so a wind proof jacket will do. The whole tour takes around 1 hour. Make sure you go to toilet situated at the entrance before or after the tour as there's no toilet at the archaeological site. It's not allowed to go into the ruins so one can only see from far. The restoration work is still on going so you might see some places covered with plastic or have black flags on it. Caral Supe in one of the oldest cities in the world. Situated in the desert, north of Lima, the ruins are easily accessible on a day trip from the Peruvian capital. I took my tour bus from parque Kennedy in Miraflores, Lima. The site if very interesting and archeological discoveries have allowed to better understand how people were living 5000 years ago. It was wonderful! I loved Every minute of it. So historical and beautiful. We watched some Peruvians dances around the site and dig.